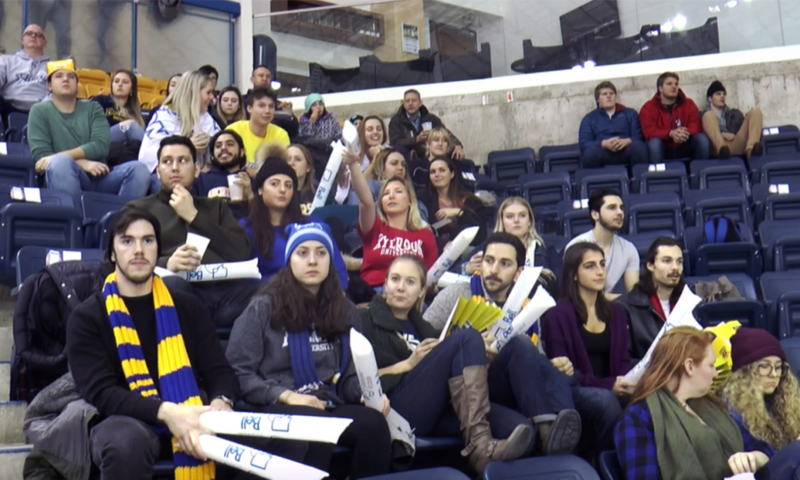 Ryerson students and alumni cheered on the Ryerson Rams men’s hockey team against the York University Lions at their second-annual winter homecoming game on Saturday. Ryerson alumni were given free tickets for the game at the Mattamy Athletic Centre thanks to a collaboration between Ryerson Athletics and Ryerson Alumni Relations. Jeff Giles, the interim athletics director, said bringing the alumni back for the winter homecoming game was an important part in creating the atmosphere in the arena. “It’s really great when alumni come back and see the students… and how much fun their having because it reminds them of the good old days,” he said. Giles said he hopes the homecoming game will inspire people to attend more regular season matches and not only the big events. After the controversy of the Ryerson Students’ Union (RSU) hosting the fall homecoming with the Toronto Argonauts, Taylor Dupuis, one of the goalies for the men’s hockey team, said it was nice to have the school’s support for this game. Ram Ganesh, the president of the RSU, said communication between Ryerson Athletics and the RSU has improved since the fall homecoming. Erica Antonitti, a second-year marketing student at Ryerson, attended both the fall and winter homecomings and said that the energy between the two games was very different. Antonitti said having the winter homecoming on campus really added to the Ryerson spirit. Giles said Ryerson Athletics is looking to host more events in partnership with other groups on campus in the future. The Rams won the game 7-6 and will be going to London, Ont., for their next game to face the Western Mustangs on Jan. 25.